Our main Sunday service is held at 10am with Holy Communion on the second Sunday of the month. Our Children's group, called Treasure Seekers, meets every Sunday during the service and includes all age groups. On the last Sunday of each month, morning service is a family service. We hold a Sunday evening service each week at 6pm in the Wesley room. This is a quiet, more contemplative act of worship. See the current copy of the Circuit Plan for more information. You can also find us on Facebook and Twitter @TrinityClithero. Our weekly notice sheet can be viewed here. The church at Trinity is made up of people who love Jesus. The ages of our congregation ranges from 3 to 93 and there is a real sense that we are a family. At the core of what we do is worship that seeks a balance between contemporary and traditional forms. Clear biblical preaching that is relevant to people's everyday lives is a vital element of who and what we are. Most of our services are enhanced and enriched by the use of modern technology, using both visual and audio presentations to illustrate and present different aspects of worship. In our services we seek to present the Gospel in clear and engaging ways with room to reflect, praise, worship, laugh and sing as we engage with the living God. As well as having a growing number of young families we also have a thriving children and young people's group called Treasure Seekers. Throughout the week there are a variety of meetings such as bible studies, social groups, a regular walking group (Amblers) and people getting together in a number of ways. 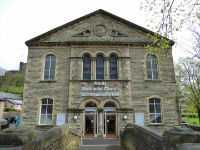 Members of our church come from Clitheroe and a variety of villages in the surrounding area. We are situated on Parson Lane in Clitheroe, next to Clitheroe Castle Field Park and across the road from the back of Booths Supermarket.